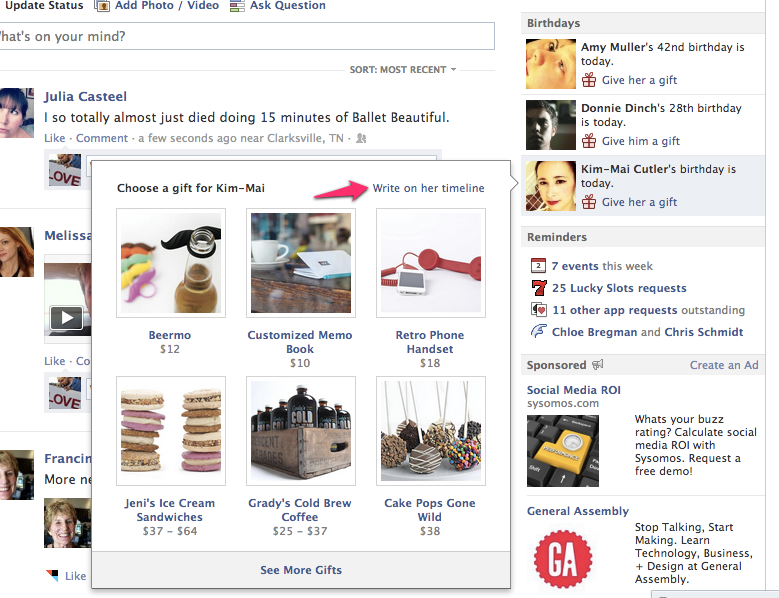 We know that Facebook is in full gear when it comes to monetization. It was obvious the second that the company announced its “Gifts” offering, which lets you send a physical or virtual item to your buddies. It’s kind of cool, and the first gift I’ve ordered is in the mail. One of the things that I enjoy doing the most on Facebook is saying “Happy Birthday!” to someone on their wall. Facebook had made this a super simple process by adding a quick link on your Newsfeed that said “Write on their Timeline.” Well, that easy shortcut is gone now, and “Give them a gift” has replaced it. Of course I want to get my close friends a gift, but not before I actually say “Happy Birthday” to them. For me, communication is at the core of Facebook’s offerings, and dropping a middle step to communication by way of selling things kind of ruins that spirit. If you hover over you can always choose to write on someone’s timeline with a little link. I’m not sure that I agree with that, and this shift certainly isn’t the end of the world. It just shows that Facebook is charting a new path to monetization, and is willing to creation friction for the communication flow that we’re used to. 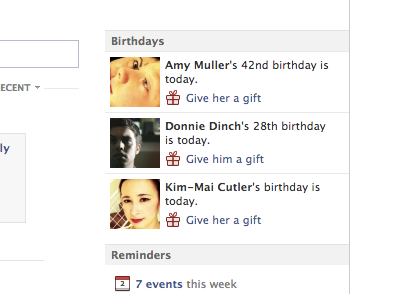 This isn’t the first time that Facebook has tinkered with birthdays, as Josh reminds me. The site used to show upcoming birthdays, then only today’s, which hasn’t really impacted Birthdayness as far as number of interactions. At one point they were even hidden. Birthday wall posts are possibly the longest-standing and most iconic emergent behavior on Facebook. Since the early days, Facebook showed whose birthday it was on the home page, and people spontaneously started leaving wall posts ranging from a standard “Happy Birthday” to more personalized messages. It’s become something of a social contract, where it’s rude to not post to a close friend’s wall on their birthday. It’s also a gauge of influence, with beloved people getting more wall posts than jerks. I just want to say Happy Birthday, man.